A Scratch Project Thank You! After creating our “Star Wars Day” Scratch project and publishing it at the end of March, I hadn’t revisited it until the day that it was to be used for our “Star Wars Technology” display. 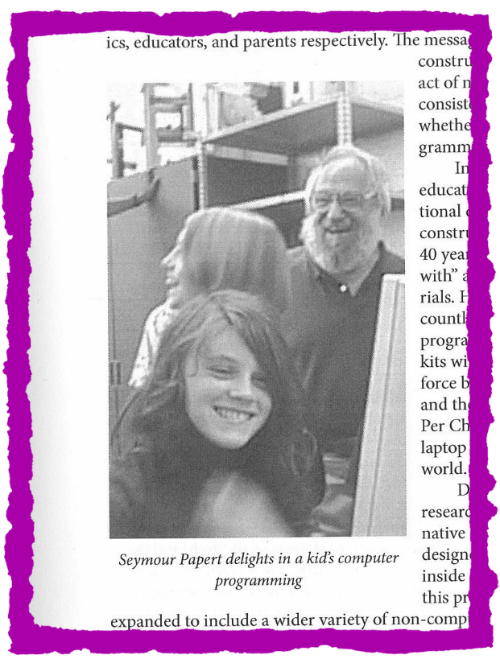 When I logged into my Scratch account I was totally amazed to discovered that the project had been viewed more than 13,000 times and had more than 400 comments! It was also exciting to see that the project had been remixed more than 30 times meaning that other Scratch users have used this project as a basis for something new. Thank you to everyone who has taken the time to view, play, like, favourite, comment and remix this project! I’ve had so much fun creating a special Scratch project that will form part of an interactive poster for an upcoming school display. 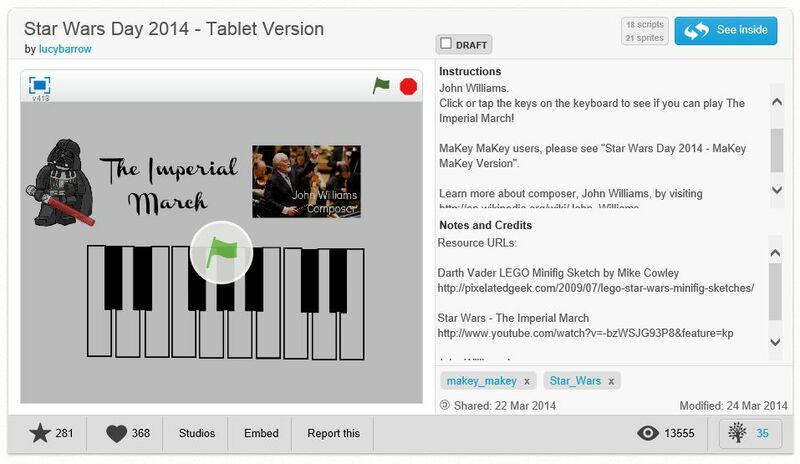 The Scratch project, “Star Wars Day” has two versions – one for a tablet and/or keyboard device, the other for use with a MaKey MaKey invention kit. Inspiration for the project came while I was listening to some music from Star Wars as my 13 year old daughter played the violin. As I listened to “The Imperial March” by composer, John Williams, some of the notes played by my daughter just happened to correspond with the famous Darth Vader theme. This gave me an idea to create a type of Scratch tutorial that would give people the opportunity to learn how to play part of the them. Soon after came the MaKey MaKey version, that allowed us to connect real world objects such as a small Darth Vader toy wrapped in wire that could be touched to hear an excerpt from The Imperial March, as well as an egg carton covered in foil that could be used as a keyboard. But it didn’t stop there! Students are still being asked to “Make a poster…” on a regular basis. I thought this might be a good opportunity to show what was possible when you explore the concept of an interactive poster. The MaKey Makey invention kit, connected to an old laptop running the Scratch project, Talking Point recording devices, QR Codes and lots of different items and surfaces provided an interactive and tactile experience for the display. I’ll provide further information about the interactive poster in a future post but, for now, I’ll leave you with a look at the Scratch project, “Star Wars Day”. 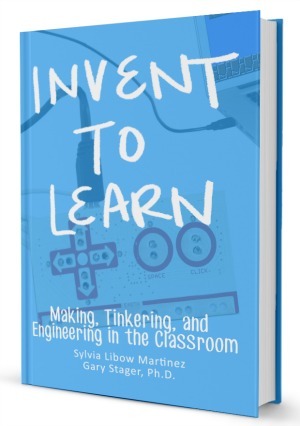 The book, Invent to Learn, is not only changing the way I look at teaching and learning but is also helping me to rediscover the “maker” in me. As a child, I loved LEGO and still have some of my original red and white bricks that I played with as a child, more than 30 years ago. There are many exciting resources mentioned in Invent to Learn, including Make Magazine. After reading about Make, I immediately arranged a subscription, ordered some back issues and started exploring the projects on their fabulous website. I came across the “LEGO Phonograph” posted by Josh Burker. Josh’s excellent step-by-step instructions made it the perfect first LEGO WeDo project for me to tackle! One of the most enjoyable parts of this project was finding some old vinyl records to use. I still have some treasured “singles” and “albums” but was a little scared to use these for fear of damage. One of my local Salvos Stores had a huge range of inexpensive vinyl records that were prefect for the project! You can view the results of the project below or click here to view the movie on the BGS eLearning YouTube Channel. I like debugging! I was actually quite surprised at how much I enjoyed this Debug-It activity! I found that, after viewing the instructions and the original blocks, I had a picture in my mind of what I needed to do. However, the rearrangement of the blocks didn’t work at all. I was totally wrong! I really enjoyed tinkering with different block configurations until I came up with my final result. I had a real sense of satisfaction knowing that I had solved the issues. I was particularly happy with the way the “Meow” speech bubbles worked with the “.5” timings. I wish I could complete more Debug-It activities in the future. What if I gave some Debug-It activities to our students? Completing these types of activities can help you to learn a great deal about your students. How do they cope with trouble shooting activities? What is their reaction when they hit a “dead end”? Do they like to work with others to find a solution or do they prefer to work alone? Please click here to view my remixed “Debug-It” project.